Dedicated to Transforming Adversity into Opportunity For Worldwide Conflict Healing. What is conflict? Whether you see conflict as a clash of ideas or emotional tension arising from incompatible needs or wants, the truth is every one of us experiences conflict in our everyday lives. Conflict resolution is the most critical skill to master in order to maintain joyful, healthy, personal or business relationships. Your ability to effectively resolve conflict will depend on how you develop and apply positive negotiation and mediation techniques to bring more peace and joy into your life. 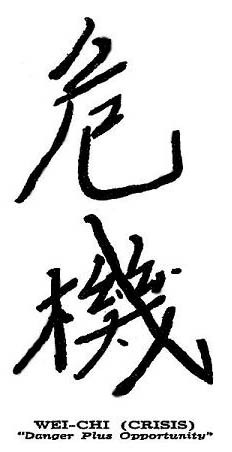 The Chinese word for conflict or crises is comprised of two symbols: “danger” and “opportunity”. In essence, when conflict manifests, it holds the potential for great good or tremendous disaster. If conflict escalates, there is a danger of destroyed relationships, violence, or even war. But when mindful people in the midst of conflict perceive divergent views as a challenge and an opportunity for problem solving, they actively listen to one another, gain insights, and achieve understanding so that they may brainstorm creative, mutually agreeable solutions. 1. Conflict causes discomfort and can be quite painful. 2. Conflict is contagious unless quickly and appropriately contained. 3. If conflict is ignored or left un-checked, it festers, escalates and spreads. 4. When conflict escalates, it can kill relationships, cause destruction of cohesive groups, lead to violence and war. 5. If you establish proper conflict “immunities” you can come into direct contact without catching it. 6. If you follow the Prescriptions for Healing Conflict approach, you will have the power to “heal” the dis-ease of conflict, and turn any adversity in your life into positive opportunity! Drag the POD icon to your iTunes podcast folder to listen to streaming audio of the interviews.